We have unknowingly shifted to cloud services and now we have OneDrive, Google Drive, Box, Sugar Sync, Amazon Drive and many other. All these cloud storage services offer more or less the same features and storage plans. Here are the many ways so that managing multiple cloud storage accounts very easy and more productive. Every service has its own pros and cons. Which one will you use? I suggest you use all and take advantage of all the special things it has. But don't worry about managing multiple cloud services. Here are the most comprehensive tools, services, and tips to manage your cloud at one place and automate the repetitive boring tasks to save time. But if you are not happy with 2GB bandwidth limit, you can go for CarotDAV. It's a little (just 2 MB) software you can install on any Windows PC which handles every cloud service available as well as an FTP server and LAN files. You get an exact windows explorer interface and you will feel, you are using files from local hard disk. 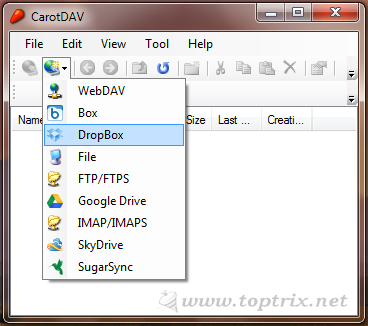 Its excellent to view, share, upload and download files saved across all cloud storage services but the only limitation of CarotDAV is, it can not transfer files from one cloud to other without downloading. Same as like attachments, you can send a file directly to your Dropbox account with 'Send To Dropbox' service. MultCloud is one such service that is free for basic users. There are many other services, but they are either paid or have a very limited quota for basic users. When you think of automation of the internet, avoid repetitive boring tasks and make the whole internet work for you, only one service comes to mind is IFTTT. You must be using this service. If not yet, start immediately. Just think of automating any task, you can do it over IFTTT. What you can do with IFTTT? You can save YouTube favorite video to Dropbox, save feeds to Dropbox, download photos from social networks to clouds, transfer files across clouds, save article favorites on Google reader to any cloud and more and more and more. It's unlimited. You just think and you can do that. Read this post about IFTTT. Do you think, Managing cloud storage services are an easy task? Please reply.